(L-R) are JCB Compact Products MD Buta Atwal; JCB Compact Products General Manager Ian Gillott; Assembly Technician Paul Mellor; Paint Sprayer Dave Thacker; Maintenance Fitter Mark Bentley; Fitter Gary Ratcliffe and Welder Melvin Sims. 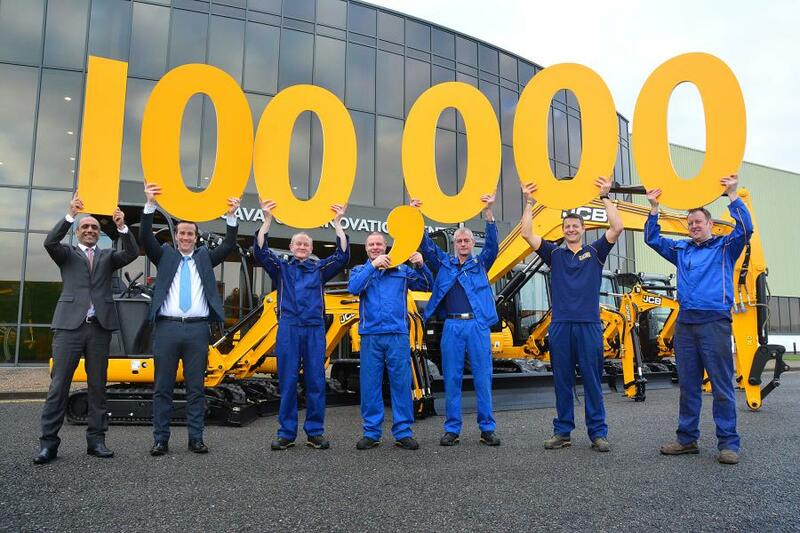 JCB celebrated the production of its 100,000th compact excavator with the promise of more innovative machines to come. The building of this 100,000th machine comes as JCB continues to grow its market share in this popular North American equipment category. JCB's first compact excavator — an 801 model weighing in at 3,307 lb. (1,500 kg) — rolled off the production line in 1989, a year when the global manufacturer produced just over 450 machines. By 1992, JCB's compact excavator range had expanded to four models with 1,000 units produced annually. On Jan. 6, the company celebrated the production of its 100,000th compact excavator — a 24,250 lb. (11,000 kg) 100C-1. It is one of 22 models in today's JCB compact excavator range. The compact excavator sector is one of the most competitive areas of the global construction equipment market and is worth an estimated $5.85 billion annually. More than 20 major manufacturers compete for this valuable business, and with almost 200,000 sold worldwide each year, it is the single largest sector of the annual 700,000-unit construction equipment market, according to the manufacturer. JCB CEO Graeme Macdonald said, “JCB has an innovative, powerful and robust range of compact excavators which keep growing in popularity. From being a challenger in the market 25 years ago, JCB is now firmly established as an industry leader, setting trends for design innovation and manufacturing excellence. JCB has recently capitalized on the growing opportunity presented by the compact excavator sector by investing $22 million in manufacturing technology and new product development. Over the past two years, this investment has led to the launch of brand new models including the 67C-1, 85Z-1, 86C-1 and 100C-1 models which compete in the 13,000 to 22,000 lb. (5,897 to 9,980 kg) weight categories.